Now that the Christmas holiday is past, school is back in session and things are returning to "normal" I'm back creating new projects to share with you. This card is made using the Love You Much bundle that Stampin' Up! has on special through this month (see earlier post for details). The card base is Regal Rose card stock cut to 5-3/4"x6-1/2" folded in half to make a 5-3/4"x3-1/4" card. 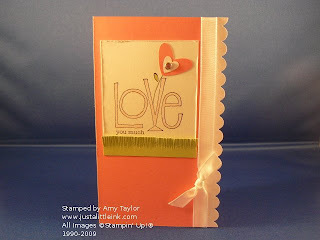 The "Love you much" stamp is stamped in Jet-Black Staz-on ink onto Whisper White card stock, then colored in using Pink Pirouette and Certainly Celery stamp pads and blender pens. The edges were distressed with the cutter kit. The Hearts are from the 3-heart punch (available with the bundle) and finished off with a pink fire circle rhinestone. The grass is a 1/2" strip of Certainly Celery card stock snipped at the top edge to create grass. Finally, a strip of Candy Lane DSP (also from the bundle) was punched with the scallop edge punch and adhered to the right opening edge, and a piece of Whisper White taffeta ribbon was tied to finish it all off!